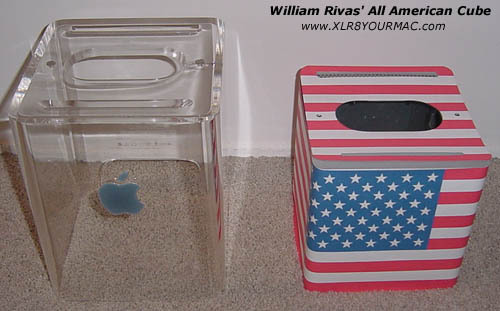 A G4 Cube owner sent pictures of his customized Cube which has a U.S. Flag design inside the shell. please look at the attached photos that show the removed inner shell with the Flag print tapped on. Other photo shows the outer shell next to the completed inner shell. The res [of the New Glory image] was 1280x1024 but made to fit on a 8.5x11" paper. I welcome other Cube owner reports on customized housings and other mods.